Bernard von Bothmer is an adjunct professor of history at the University of San Francisco and Dominican University. He is the author of "Framing the Sixties: The Use and Abuse of a Decade from Ronald Reagan to George W. Bush" (University of Massachusetts Press, 2010). Ron Reagan, one of only twenty-seven living children of American presidents, has written a fascinating portrait of the nation’s fortieth president. My Father at 100 is a moving tribute to the eternal, and complicated, bonds between fathers and sons and between children and aging or deceased parents. It also offers detailed insight into the character and personality of the enigmatic Ronald Reagan. A writer, radio and television host, and political commentator, Ron (to avoid confusion with his father, referred to as Ron in this review) narrates his tale with refreshing frankness. “His children, if they were being honest, would agree that he was as strange a fellow as any of us had ever met” (7), he writes. “A paradoxical character, my father; He was warm yet remote. As affable as they come, he had, in later life, virtually no close friends besides his wife” (9). To critics who called his father “an actor,” Ron notes, “He played only one role, ever, and he did so unconsciously, totally absorbed in his performance” (12). Ron observes “two primary threads jumping out of my father’s story line: that fierce desire to be recognized as someone noteworthy, even heroic; and his essentially solitary nature” (12). Ron seeks to shed light on the “enduring mystery of [my father’s] inner character” (14), focusing on his youth in Illinois, where Ron traveled to examine his family’s past. Reagan’s high school lifeguarding in Dixon -- “the best job I ever had” (117), he told Ron -- is a central focus. Reagan saved seventy-seven lives -- many of whom never said thank you. Lifeguarding suited Reagan’s desire to be seen and “to feel like a hero” (122), and satisfied a strong desire for order in the world. Ron was shocked to learn that a U.S. Olympic swimming coach offered Reagan a chance to earn a spot on the 1932 team; Reagan declined because he needed the steady lifeguarding paycheck. Ron astutely describes the lifeguard stand as “a stage,” and Reagan “the undisputed leading man” (138). At Eureka College, Reagan was an athletic and stage star and class president who realized he had an almost magical ability to connect with a crowd while speaking. Though from modest means, Reagan had a bright future ahead of him: as Ron notes, only 7 precent of Americans had college degrees in the early 1930s. Ron sees his father at Eureka as “solitary and separate, even while a part of the team” (157), in line with what it was like growing up with his father: “He seemed more comfortable in front of a crowd of total strangers that he did sitting at the dinner table surrounded by family” (157). The book surveys Reagan’s move to Hollywood; his governorship; the 1976 race against Ford; Iran-Contra; the end of the Cold War; and offers a touching description of Reagan’s slow descent into Alzheimer’s. Especially gripping is Ron’s account of the failed 1981 assassination attempt. Ron recounts what a miracle it was that Reagan survived, and the role of sheer luck. In the moments after the shooting, the presidential limousine, for safety reasons, raced to the White House, and not to a hospital; no one initially knew Reagan was wounded. Ron is a gifted stylist who inherited his father’s talent for storytelling and evoking a scene, with a vivid eye for the telling detail, writing of his father driving with his young family with “no seat belts; and Dad with a can of cold Budweiser gripped between his thighs” (64). The book has great pacing, and the flow in the narrative between Reagan’s past and Ron’s childhood works especially well, as does the weaving in of episodes in American history throughout his history of the family -- the War of 1812, the 1832 Black Hawk War in Illinois, the America of Reagan’s birth in 1911, the flu epidemic of 1918-1919 (a virus contracted by nearly 30 percent of Americans, among them Reagan’s mother), and the Jazz Age. Long before he battled hippies and anti-war protesters, Reagan railed against the 1920s, “his generation’s version of the 1960s” (112). We learn much about Reagan’s parents, and their troubled household. Reagan’s mother Nelle, a Methodist, in deference to her husband, allowed her first son, Moon, a Catholic baptism. “But by the time of Ronald’s birth, however, she had stiffened her religious spine. There would be no further compromise with the Catholic Church” (51). Nelle is portrayed as a saintly woman, who throughout her life served meals in her home to the destitute and homeless. Reagan’s father, Jack, had many personal and professional failings. But he also once slept in his car in protest one evening on a business trip when the manager told him he would like the hotel because it did not accept Jews. Jack got pneumonia that evening, leading to health problems that would eventually kill him. Some of the book’s most powerful parts, in this book of a father and his son, concern Reagan’s complicated relationship with his own father. When Ron discusses Jack with Nancy Reagan, the tension and disgust is palpable -- yet she never met Jack, who died a decade before she met Ronald Reagan. All she knew of him, she learned from the future president. Ron is a talented armchair psychologist. He writes of his father’s “almost pathological squeamishness with regard to interpersonal conflict and his reflexive tendency to defer to perceived experts” (68), and who “was always acutely uncomfortable with roiling emotions and harsh words” (69). The upheaval of World War I “does not seem to have sat easily with Dutch” (76), he observes. In reaction to his father’s drinking and difficulties holding down a job, Reagan “began developing his preternatural talent for excising unpleasantness from his picture of reality” (73). To Ron, his father’s school photos show a previously outgoing baby who “by his early boyhood ... turned inward” and had begun “cultivating his solitary inner self” (77). As a child in a tense household, Reagan wanted above all “order and predictability” (78–79). Ron has little interest in the countless photographs of Reagan the politician; “Early pictures, though, especially casual snapshots ... from his childhood, exert a profound fascination -- like a portal allowing time travel” (54). My Father at 100 demonstrates how Reagan’s personality was a perfect match for the modern conservative movement. As an adolescent, Ron would talk endlessly about the dark stains in America’s past, but Reagan would have none of it: American had always been a land blessed by God that could do no wrong. Reagan’s political rise was fueled by backlash against “the sixties,” and Reagan’s public persona was the same as his private behavior towards his rebellious son. In the 1970s, Reagan had “had about as much as he could take of shaggy-haired, ungrateful kids flipping off those he considered to be responsible parental figures” (70). The conservative movement rose to prominence with an aggressive, at times angry, message. That harshness is absent in this portrait of Reagan, who was consistently calm and gentle at home. Ron’s political views, past and present, make this book especially interesting. An atheist against the Vietnam War who got kicked out of high school, growing up Ron “was a poor candidate for membership in the Young Republicans” (67). Has the child of a president ever so openly supported the other political party? Ron was an outspoken critic of the George W. Bush administration, especially the Iraq War; spoke at the 2004 Democratic Convention; and in 2008 publicly endorsed Barack Obama. My Father at 100, however, shies away from policy differences between father and son, beyond brief criticisms of supply-side economics and the Vietnam War. The book is laced with humor. When Reagan was running for president in 1976 and tried to visit the apartment where he was born, he found that the couple living there, who were out of town that day, had forgotten, as promised, to leave a key under the mat. Reagan would have to wait until 1991 before he set foot inside. There are amusing tales of the reaction Ron elicits when digging for family history when it comes out he is Reagan’s son: “It is him!” he hears as he enters Dixon’s visitor center. Ron writes of getting locked at night into the park where Reagan served as a lifeguard and having to go off-road around the gate to make his way out. A popular pastor that tries to have Ron denounce his atheism as a twelve-year-old is described as “a bit too popular,” forced to resign due to “shepherding certain members of his flock in carnal fashion” (106.) Discussing the lifelong tensions and awkward exchanges between Reagan and his older brother, Moon (who died in 1996, also from Alzheimer’s), Ron describes an awkward photo of the two the night of Reagan’s first inauguration, as both try -- each unsuccessfully -- to smile for the camera. The former president did not know he was incredibly nearsighted until he was thirteen, when he just happened to put on his mother’s glasses. How whole world immediately changed. At Eureka, Reagan got a “C” in U.S. history and a “D” in a course on Jesus. No wonder so few politicians release their college transcripts. A few problems exist, however. Oddly, my edition had more typographical errors than any book I can recall recently reading. And the starry-eyed hero worship can get a bit overdone, especially when describing Reagan’s college football triumphs. But the author can be forgiven for this, considering it is a son writing about his deceased father. What comes across most in these pages is Ron’s deep love for his father. 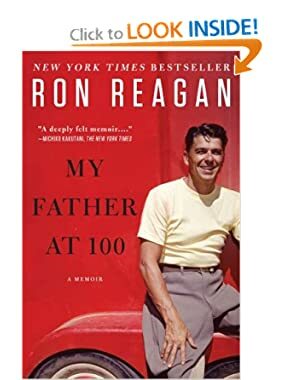 Looking at a childhood picture of Reagan, Ron remarks that “In a rush of tenderness I want to catch him up in my arms and place him somewhere safe, beyond anger and disappointment” (56). Reagan’s official biographer, Edmund Morris, famously had a difficult time revealing the real Reagan, so much so that his “biography,” Dutch, had to resort to using fictional characters. Readers frustrated by that approach will learn a great deal from this book. But Ron does share some of Morris’s analysis, concluding that his father “was easy to love, but hard to know” (227).